Mid-way through the last century, America abandoned “Progressive Education” because of its damaging effects on children from poor families. At the heart of progressivist teaching and learning was the “project” which addressed a problem in the “real world” and which pupils solved in collaboration, often drawing on concepts from a range of subject domains. Teaching was “thematic” and the traditional curriculum, centred on subject-specific knowledge and skills, was set aside for one determined by a range of projects which the pupils found emotionally engaging and therefore motivating. Progressivists believed that in a rapidly changing world, where what was considered fundamental today could be deemed irrelevant in a matter of months, pupils should “learn how to learn” by acquiring “accessing” skills rather than striving to master the rules of English grammar, or becoming proficient with mathematical algorithms. Pupils needed to acquire “critical thinking skills,” “higher-order skills,” “problem-solving skills,” “discovery skills,” “lifelong learning skills” and “meta-cognitive skills.” Rather than mastering subject knowledge, pupils should develop skills which would enable them to find knowledge through collaborative activity which nurtured their emotional well-being and inculcated personal and civic virtues. All endeavours to maximise pupils’ grades and test scores were frowned upon as merely encouraging competition which had the potential for damaging self-esteem and threatening the pupil’s love for learning. The teacher was urged to switch roles from one who merely “transmitted knowledge” to one who facilitated the pupil’s acquisition of “inquiry skills” by creating a learning environment conducive to discovery. The latest “educational science” was used to undermine those who continued to make the case for more traditional approaches to teaching and learning. Recent American experience of portfolio assessment reveals that portfolio-based curricula (the type favoured by progressivists) can, for example, undermine the acquisition of basic numeracy skills (Koretz, Stecher, Klein, McCaffrey and Deibert, 1994). Ravitch (1983, 2000) claims that in progressivist schooling, while the parents of children from middle class backgrounds can have their children coached in the basics at home, the basic skills of children from more deprived backgrounds simply atrophy through lack of practice. Drill and practice had no place in the progressive classroom and therefore middle class parents ensured that such skills were practised at home. For less fortunate children, from homes which weren’t conducive to study, school provided the only opportunities to practise basic skills. Progressivist reluctance to devote class time to drill and practice was therefore particularly injurious to the life chances of these less fortunate children. I had an open classroom; I had learning stations; I had children write books and stories to share; I provided games and used weaving to teach math and fine motor skills. I threw out all the desks and carpeted open learning areas. I was doing what I had learned – and it worked. Well at least it worked for some of the children. My white students zoomed ahead. They worked hard at the learning stations. They did amazing things with books and writing. My black students played the games; they learned to weave; and they threw the books around the learning stations. They practised karate moves on the carpet. Some of them even learned how to read, but none as quickly as my white students. I was doing the same thing for all my kids – what was the problem? … As my classroom became more “traditional,” however, it seemed that my black students improved in their reading and writing. Paula is learning to listen effectively and is developing confidence in her spoken Spanish. She has enjoyed using email to correspond on familiar topics with her Spanish e-pal in our partner school and has made good use of ICT sources to locate information for our class Spanish Holiday Project. While she readily takes the lead in group work and is always willing to make decisions, she needs to be encouraged to listen to and respect the opinions of others. This would allow her to broaden her thinking and develop her capacity to experiment with different approaches to problem solving. The main conclusion of the sociological research must be that much of this reform activity, such as the introduction of comprehensive schooling, has been ineffectual in reducing social inequalities in outcomes. Consequently, it has proved hard to claim that the comprehensive systems dotted around the country had either demonstrably superior effects on pupil performance than those where selection (or some degree of selection) had been retained or an impact on class differentials. The claim that the new curriculum is progressivist begs the question, “why would CCEA be tempted to adopt a curricular model rejected four decades ago because of its deleterious effects on the poor?” At least part of the reason could be that they believe that advances in our understanding of the structure of the human brain favour a re-examination of the progressivist ideal. Maybe a new progressivism built on brain science will alleviate social disadvantage rather than exacerbating it. The “brain sciences” have pride of place in CCEA’s scientific rationale for the new curriculum. Alas, CCEA get the science entirely wrong, falling prey to what philosophers call the “mereological fallacy.” Given the ease with which this pseudo science can be debunked, the entire rationale for radical curriculum reform crumbles. Presumably it is CCEA’s hope that parents, teachers and policy-makers will embrace a more thematic curriculum, founded on the collaborative solution of cross-curricular tasks selected for their appeal to young people, if the case for such a curriculum can be shown to have a basis in science. But the science comes from the “brain-based learning” movement. Nowhere in serious scientific journals is it claimed that the structure of the brain has lessons for curriculum design. The writings of Robert Sylwester, who addressed CCEA’s “Mind Power 21” conference, give the best insight into the “science” that underpins the new curriculum. Because the brain is “junglelike,” Sylwester posits that there should be less time devoted to basic skills; rather, “thematic curricula, cooperative learning and portfolio assessment” should dominate the curriculum. Such unproven assertions aren’t science. One of the central features of progressivism is the changing role of the teacher from one who instructs and guides, to one who “facilitates.” At the heart of CCEA’s model is the novel concept of “Assessment for Learning” (AfL) in which pupils take greater responsibility for assessing their own work and that of their peers. “Comment only marking” is another feature of AfL; teachers are encouraged to restrict themselves to a verbal comment when marking pupils’ work, and are discouraged from giving test scores and grades because this impacts negatively on motivation and pupil self-concept. Now CCEA might argue that there are aspects of AfL – such as comment-only marking – which would be considered so unpalatable to parents that they could find no place in the new curriculum. But CCEA have no room for manoeuvre here because the “robustness” of the Costello profile is predicated on robust teacher assessment. By failing to enforce comment-only marking CCEA would be, to use assessment jargon, “threatening consequential validity,” thereby vitiating the fitness-for-purpose of the Costello Profile. What can be said about the capacity of Northern Ireland education reform to alleviate social disadvantage? The Pupil Profile’s failure to comply with any of the accepted norms of the measurement literature, together with its capacity for multiple interpretations, could lead to de facto comprehensive schooling which has been powerless to alleviate class inequalities (Breen, 2005). CCEA’s Revised Curriculum would claim to differ from the progressivism of the first few decades of the last century in that it has a strong scientific underpinning, but this paper undermines that notion. What Northern Ireland schools are being offered is precisely what American schools offered their children in the first few decades of the 20th century: a curriculum injurious to the life chances of the disadvantaged. In short, assessment and curriculum combine to maximise social differentials. In a brief (unpublished) paper, “Reliability and validity in the Costello Profile,” this author used the educational measurement literature to demonstrate that the Costello Profile cannot guide parents in choosing appropriate post-primary schools for their children. In an earlier (also unpublished) paper, “The case for an alternative to the Costello Pupil Profile,” it was argued that the Profile – which uses language capable of many interpretations – could be exploited by the wealthy to steal a march on parents from poor and working class backgrounds. Moreover, there is a danger that the private tutor who hitherto “drilled” the pupil in preparation for the Transfer Test might now be employed by wealthy parents to complete the work that eventually forms the basis of the tutee’s Profile. The vague language used in the Profile, together with its openness to abuse by those with the necessary financial resources, could mean that the move from objective test to profile reduces rather than enhances social mobility. It is this stress on objectivity that prompted the author to suggest an alternative to the Costello Profile. The CAT-mediated Pupil Profile allows the primary school child to develop a formative test-when-ready profile comprising objective measures of Literacy, Numeracy and ICT, which can inform the subsequent conversation between the child’s parents and the post-primary headteacher. Jerome Karabel’s (2005) detailed study of Harvard’s transition from admissions test to profile, “The Chosen,” may help teachers, parents and policy-makers anticipate the likely impact on social mobility of the current proposals. The move from objective entry criteria, based mainly on academic attainment, to profiles, effected a dramatic collapse in the number of Harvard undergraduates from the public schools. The focus of this paper is curriculum rather than assessment. It sets out to demonstrate an equivalence between the Northern Ireland Council for the Curriculum, Examinations and Assessment’s (CCEA) curriculum proposals and the American progressivist curriculum movement of the first half of the last century. CCEA’s use of neuroscience to claim that they are looking forward to a curriculum relevant to the 21st century, rather than looking back to an outdated and discredited progressivism, is rejected. It is argued that their use of ideas from the “brain-based learning” movement replaces serious scientific discourse with little more than pop science. With the appeal to neuroscience undermined, the case is made that CCEA are offering a re-packaged form of the progressivism which collapsed half a century ago largely because of its negative impact on the socially disadvantaged. Recently neuroscience has established a number of factors, which are critical to learning and to motivation, about how our brains process information. We now know that the human brain creates meaning through perceiving patterns and making connections and that thought is filtered through the emotional part of the brain first. The likelihood of understanding taking place is therefore increased significantly if the experience has some kind of emotional meaning, since the emotional engagement of the brain on some level is critical to its seeing patterns and making connections. … Neuroscience, therefore, highlights the need for learning to be emotionally engaging, particularly during the 11-14 range when so much is going on with adolescents to distract them from school. Their conscious effort to build curricula around children’s interests instead of intellectually challenging studies implied not only anti-intellectualism but a huge disadvantage for children of poor and immigrant families, because (as Dewey noted) children’s interest are conditioned by what they already know and have previously been exposed to. It is clear that CCEA predicate this radical transformation of schooling on ideas derived from the brain-based learning movement. If CCEA’s reading of neuroscience were founded on sound science then teachers might feel compelled to rethink entirely how they teach and how pupils learn. The aim of this paper is to make the case that CCEA have based curriculum reform in Northern Ireland on pseudo science. If the reader glances back though the quotations from CCEA’s curriculum documents presented in the previous section, it will be clear that CCEA attribute a range of activities to the brain. Brains “process information,” “create meaning,” “perceive patterns,” “make connections” and “search for patterns.” Now where is the scientific evidence for these claims? There are no laboratory demonstrations of brains creating meaning or perceiving patterns. These are activities carried out by human beings, not by their brains. No one would dispute that without a functioning brain an individual couldn’t process information or search for patterns, but it doesn’t follow that the individual’s brain is doing the information processing or the searching. Those who offer seminars and in-service training in “brain-based learning” often refer to brains “thinking,” “knowing,” “believing,” “deciding,” “seeing an image of a cube,” “reasoning,” “learning” and so on. In the words of possibly the greatest philosopher of modern times: “Only of a human being and what resembles (behaves like) a living human being can one say: it has sensations; it sees, is blind; hears, is deaf; is conscious or unconscious” (Wittgenstein, 1953, §281). If, as CCEA claim, the human brain can process information, make connections, search for patterns, “This would be astonishing, and we should want to hear more. We should want to know what the evidence for this remarkable discovery was” (Bennett & Hacker, 2003, p. 71). It is important to appreciate the depth of the error committed here. When CCEA’s claim that brains process information is called into question, this doesn’t render valid the assertion that brains, in fact, cannot process information. Advocates of brain-based learning see the brain as the locus of thought; the brain is where thinking occurs. Wittgenstein, while accepting that without a properly functioning brain one couldn’t think, nevertheless teaches that thinking is done by the whole person, and not the brain. When a teacher asks a pupil what she thinks, the pupil expresses her thoughts in language. Were it not for the pupil’s language skills, the teacher couldn’t ascribe thoughts to her. Since brains aren’t language-using creatures, how can it make sense to ascribe thoughts to a brain? It is vital that the reader understand that falling prey to the mereological fallacy is more than a difficulty with nomenclature. When CCEA claim that “thought is filtered through the emotional part of the brain first” (CCEA, 2003b, p. 22) they are using the word “thought” in the way it is usually used in everyday psychological vocabulary. They are making the case that the learning that takes place in traditional curriculum models – where pupils struggle to relate emotionally to dull domain-specific knowledge – is somehow mere “surface” learning because the emotional brain occludes the pupil’s thought in its passage to the cognitive brain. If the curriculum was designed around projects which are emotionally engaging to pupils, however, learning would be “deep” because thought would flow unobstructed to the cognitive part of the brain. The defence that this is all just a matter of semantics, that reference to the brain thinking is little more than a façon de parler, is not open to CCEA. To make their case, CCEA must be claiming that thoughts are in the brain and a thought follows a physical trajectory through a physical emotional section of the brain to a physical cognitive section of the brain. Now why should the structure of the brain have consequences for the curriculum? Robert Sylwester (a brain-based learning enthusiast who presented his ideas at CCEA’s “Mind Power 21: Educating Intellect and Emotion” conference) has this outrageous answer: because the brain is “junglelike,” the classroom and the curriculum should also be junglelike. CCEA’s curriculum rationale: science or pop science? According to the view of the causal theorist, the child’s knowledge of the ABCs is a mental state or process that causes or tends to cause correct answers, just as the increasing temperature of an iron bar tends to make the bar more flexible. But this is an erroneous way of viewing the matter. Instruments could be employed for recording the temperature of the bar, and other instruments for determining its flexibility; and one set of measurements could be taken independently of the other set. But what would it mean to determine whether the child knew the ABCs independently of its response to testing? Having “established” that certain areas of the brain “light up” when the child is reading a passage of prose, Sylwester avoids questions such as, “what do these areas look like when the child fails to read a passage presented to her?” How would the image change if the child’s reading was faltering? A teacher can recognise faltering reading from the child’s behaviour (her reading) but how would the neuroimage of a confident reader differ from that of a faltering reader? How does a brain scan look when a child’s reading lacks expression? Clearly, brain states do not stand in relation to behaviour as a cause stands to an effect. Sylwester’s (1995) claim that the brain sciences can reduce the uncertainty experienced in inferring children’s mental states from what they say, write or do, is mistaken. The relation isn’t as he imagines it and it emerges that this uncertainty is irreducible. Sylwester (1995) argues that we teach as we do and structure the curriculum and timetable as we do because teaching remains a “behaviourist” profession. In his view, advances in the brain sciences have important lessons for pedagogy and curriculum design: curricula should be thematic, learning should be cooperative and assessment should be by portfolio. Sylwester clearly believes “inner” brain states cause “outer” behaviour. For him, the inner and the outer are two autonomous realms which stand in an external causal relation to one another. In typical classroom scenarios, because teachers can’t get information about the inner states of the child, they have to try to infer something about these inner states from the pupil’s outer behaviour. “Outer” information is portrayed as a poor substitute for the child’s “inner” brain state. In Sylwester’s model the teacher has only indirect access (he or she must settle for the child’s outward behaviour) to what the neuroscientist can access directly (the child’s inner states which explain the outer behaviour). In some brave new world, however, the teacher’s uncertainty could be reduced by looking directly at an image of the child’s brain. According to Sylwester, the uncertainty arises because the teacher cannot have direct access to the child’s brain states, but he is confident that this uncertainty can be reduced by neuroimaging. Sylwester looks forward to the day when teachers needn’t settle for indirect evidence of the inner but grasp the opportunities offered by neuroscience to secure direct access to the inner. [Wittgenstein] suggests that it is less misleading to say that thoughts are not (metaphysically) hidden from another person, but are manifest in different ways to me and to her: to me as expressions, to her as observations of those expressions. Sylwester and CCEA fail to grasp this profound first-person/third-person asymmetry that characterises educational predicates, and mistakenly portray the pupil as having direct access (via introspection in the case of mental images) to a hidden inner realm whose contents, alas, must remain a matter of conjecture for the teacher. Sylwester spurns behaviourism (where mental states could be explained wholly in terms of “bare” behaviour) for Cartesian dualism (where mental states are wholly separable from behaviour). But, according to Wittgenstein, Sylwester has rejected one flawed model for another equally flawed model. In fact, the answer lies between these two extremes: “the expression of a mental process is a criterion for that process; that is to say, it is part of the concept of a mental process … that it should have a characteristic manifestation” (Kenny, 2004, p. 49). Thinking is better modelled on potential behaviour than mental activity. (vii) the merging of the traditional academic subjects into themes and core skills – skill development is valued over the integrity of subject mastery. progressivist criteria (and therefore are potentially damaging to the poor), the remainder of this section will take each criterion in turn in order to make the case that CCEA’s curriculum is progressivist. CCEA builds the new curriculum on the ideas of the brain-based learning movement which teaches that the greater the match between how the learning environment is arranged and the way the brain “learns,” the greater the educational experience of the child. But, as demonstrated above, it is meaningless to speak of brains learning, understanding, remembering, thinking, reasoning, and so on. Moreover, CCEA’s “science” flies in the face of first-person/third-person asymmetry, a property of all educational attributes. With this foundation stone gone, how are CCEA to justify, for example, the current emphasis on thematic teaching and learning where pupils collaborate in the solution of projects designed to connect multiple content areas? 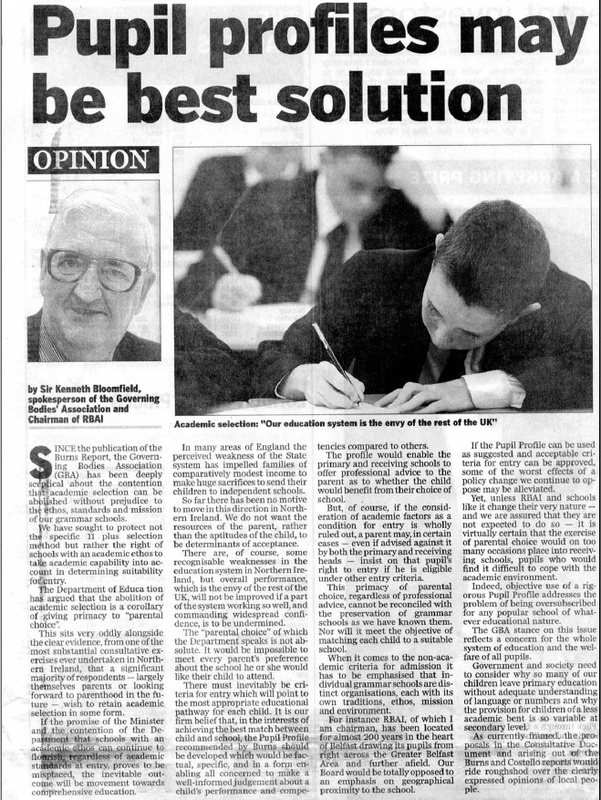 CCEA’s curriculum proposals are a long way from Oakeshott’s (1989, p. 62) definition of education as “a specific transaction which may go on between the generations of human beings in which newcomers to the scene are initiated into the world they inhabit.” For Oakeshott, the purpose of education was to train young people in the valued practices of the culture. While Oakeshott considers the whole (human practices, rules and customs) as primary, CCEA give pride of place to the parts (individual children). Recently the ‘Goodison Group’ … made a plea for educational research to be more like research carried out by commercial companies when launching a new product, asking questions like: What is most likely to attract the customer? … The crux of the group’s argument is that the voice of the learner has largely been absent from research and, therefore, the educational product is not properly aligned to the needs of the consumer. CCEA also claim that young people learn best when they “are involved in learning that is relevant, motivating and emotionally engaging and builds on their interests and experiences” (CCEA, 2003c, p. 15). The development of higher order thinking skills dominates all of CCEA’s curriculum documentation and practically every frame of their “Proposals for Curriculum and Assessment at Key Stage 3” promotional video. These skills are measured by having pupils collaborate in solving contextualised, ill-structured problems which they perceive as relevant and which require them to make connections between concepts belonging to different traditional subject areas. The author can find no learning outcome in all the documentation for which the fit-for-purpose assessment wouldn’t be an extended piece of coursework. Learning” (Black & Wiliam, 1998). Assessment for Learning (AfL) discourages the practice of awarding marks and grades because they invite pupils to compare themselves with one another and this is likely to be demotivational for low achievers. Proponents of AfL fear pupils awarded low scores or grades relative to their peers may turn their backs on learning. AfL aims to preserve motivation by using “comment only” marking. In general, feedback given as rewards or grades enhances ego rather than task involvement – that is, it leads students to compare themselves with others and focus on their image and status rather than encourage them to think about the work itself and how they can improve it. Feedback by grades focuses students’ attention on their ‘ability’ rather than on the importance of effort, damaging the self-esteem of low attainers. Feedback which focuses on what needs to be done can encourage all to believe they can improve. … A culture of success should be promoted where every student can make achievements by building on their previous experience, rather than by being compared with others. Another striking progressivist feature of AfL is the pupil taking on elements of the teacher’s role. In the new curriculum pupils will be trained to self-assess and peer-assess. To this end AfL requires that they be taught to interpret and design assessment criteria. Having undermined the thesis that CCEA’s brand of progressivism represents an advance on the progressivism promulgated in the early decades of the last century (by questioning the scientific rationale for CCEA’s proposals), it should now be possible to use the literature of that period to critique the curriculum proposed for Northern Ireland schools. Before turning to this task, it is instructive to first offer further evidence in support of the equivalence between CCEA’s curriculum for the 21st century, and old-fashioned 20th century progressivism. Many elementary school teachers were comfortable blending different subjects because they had long been responsible for teaching a variety of subjects in their classrooms. … At the high school level, however, teachers reacted sceptically to interdisciplinary studies because they were likely to have been educated to teach a specific subject – English, history, mathematics, or science – and were therefore less willing to merge their subject with another teacher’s. Citizenship (Ravitch, 2000, p. 127) was well established by the 1920s and was augmented by “industrial intelligence” (Ravitch, 2000, p. 78), what CCEA now call “Employability” in the Costello Profile. Having further established the equivalence between American progressivism and CCEA’s proposed curriculum, it is instructive to appreciate the principal reason for the demise of this curriculum model: its impact on the poor. This paper has sought to argue that the proposed changes to the assessment and curriculum framework will impact negatively on the life chances of children of socially disadvantaged parents. Critics of progressivism in the educational literature side with such prominent champions of socially disadvantaged children as Gramsci and Bourdieu in suggesting that these children do best when given focused instruction in well-ordered classrooms and where assessment is by examination rather than portfolio; in short, the very teaching and assessment model that Northern Ireland is currently turning its back on. The case was made that Northern Ireland is being offered the same progressive curriculum that America was forced to abandon in the 1960s because of its impact on children from poor and working class backgrounds. CCEA’s attempt to mobilise a scientific argument comes to nothing; it falls prey to the mereological fallacy, and, like all proponents of brain-based learning, it mistakes the relation of the inner to the outer as external rather than internal, and fails to appreciate that first-person/third-person asymmetry is the defining feature of educational predicates. Finally, it is instructive to offer another illustration of how easily the entire edifice (assessment and curriculum) can crumble. Take the concept that underpins both the Pupil Profile and the new curriculum model: Assessment for learning (AfL) (Black & Wiliam, 1998). This has all the hallmarks of progressivism; it exhorts teachers to eschew marking and grading, and parents may the puzzled at instruction time being given over to the training of their children as assessors of their own work and that of other pupils. Assessment for Learning underpins the Costello Pupil Profile also. The Costello Profile can only be deemed “robust” if teacher assessment is demonstrably robust. AfL enthusiasts argue that those who criticise teacher assessment fail to appreciate just how unreliable external examinations are. But the more the proponents of AfL highlight the fallibility of summative tests, the more they undermine AfL itself. It is important to grasp that when CCEA adopted AfL it was (and still is) an intervention in search of a theoretical underpinning. Presumably, then, CCEA must have embraced AfL because of its claim to raise the performance of pupils by just over one GCSE grade (Black & Wiliam, 1998). But a rough calculation based on an analysis of the standard error of measurement in public examinations would indicate that this performance rise is within error; it isn’t real! This calls into question the principles at the heart of both the curriculum and the Costello Profile. Finally, “comment only marking” is a central feature of AfL; teachers are encouraged to restrict themselves to a verbal comment when marking pupils’ work, and are discouraged from giving test scores and grades because this impacts negatively on motivation and pupil self-concept. Now CCEA might argue that there are aspects of AfL – such as comment-only marking – which would be considered so unpalatable to parents that they could find no place in the new curriculum. But CCEA have no room for manoeuvre here because the “robustness” of the Costello profile is predicated on robust teacher assessment. By failing to enforce comment-only marking CCEA would be, to use assessment jargon, “threatening consequential validity,” thereby vitiating the case for robustness. Curriculum and assessment are entangled: it appears that robust assessment is predicated on radical progressivism. What can be said about the capacity of Northern Ireland education reform to alleviate social disadvantage? The Costello Profile’s failure to comply with any of the accepted norms of the measurement literature, together with its capacity for multiple interpretations, will, in effect, lead to comprehensive schooling which Breen (2005) argues is powerless to alleviate class inequalities. The associated curriculum would claim to differ from the progressivism of the first few decades of the last century in that it has a strong scientific underpinning. This paper undermines that notion; what Northern Ireland schools are being offered is what American schools offered their children in the first few decades of the 20th century – a curriculum injurious to the life chances of the disadvantaged. In short, assessment and curriculum combine to maximise social differentials. Armstrong, D.M., & Malcolm, N. (1984). Consciousness and causality. Oxford: Basil Blackwell. Black, P., Harrison, C., Lee, C., Marshall, B., & Wiliam, D. (2003). Assessment for learning: Putting it into practice. Buckingham: Open University Press. Black, P., & Wiliam, D. (1998). Inside the black box. London: King’s College. Bourdieu, P. (1974). The school as a conservative force: scholastic and cultural inequalities. In J. Eggleston (Ed. ), Contemporary research in the sociology of education (pp. 32-46). London: Methuen. Breen, R. (2005). Why did class inequalities in educational attainment remain unchanged over much of the twentieth century?, In A.F. Heath, J. Ermisch, & Gallie, D. (Eds. ), Understanding social change (pp. 55-72). Oxford: OxfordUniversity Press. CCEA (2003a). Is the curriculum working? Summary of the Key Stage 3 phase of the Northern Ireland curriculum cohort study. Belfast: Council for the Curriculum, Examinations and Assessment. CCEA (2003b). Proposals for curriculum and assessment at Key Stage 3. Part 1: Background rationale and detail. Belfast: Council for the Curriculum, Examinations and Assessment. CCEA (2003c). Proposals for curriculum and assessment at Key Stage 3. Part 2: Discussion papers and case studies. Belfast: Council for the Curriculum, Examinations and Assessment. CCEA (2003d). Proposals for curriculum and assessment at Key Stage 3. Teacher’s Folder. Belfast: Council for the Curriculum, Examinations and Assessment. Delpit, L.D. (1986). Skills and other dilemmas of a progressive black educator. Harvard Educational Review, 56(4), 379-385. Gardner, J., & Cowan, P. (2000). Testing the test: A study of the reliability and validity of the Northern Ireland transfer test in enabling the selection of pupils for grammar school places. Belfast: Queen’s University of Belfast. Gladwell, M. (2005, October 10). Getting in: The social logic of Ivy League admissions. The New Yorker, 80-86. Gray, J. (2005). Is failure inevitable? The recent fate of secondary school reforms intended to alleviate social disadvantage, In A.F. Heath, J. Ermisch, & Gallie, D. (Eds. ), Understanding social change (pp. 73-91). Oxford: OxfordUniversity Press. Hark ter, M.R.M. (1990). Beyond the inner and the outer: Wittgenstein’s philosophy of psychology. Dordrecht: Kluwer Academic Publishers. Harré, R., & Tissaw, M. (2005). Wittgenstein and psychology. Burlington, VT: Ashgate. Heath, A.F., Ermisch, J., & Gallie, D. (2005). Understanding social change. Oxford: OxfordUniversity Press. Karabel, J. (2005). The chosen: the hidden history of admission and exclusion at Harvard, Yale and Princeton. New York, NY: Houghton Mifflin Company. Kenny, A. (2004). The unknown God: Agnostic essays. London: Continuum. Koretz, D.M., Stecher, B.M., Klein, S.P., McCaffrey, D., & Deibert, E. (1994). Can portfolios assess student performance and influence instruction? The 1991-92 Vermont experience. Santa Monica, CA: RAND Corporation. Oakeshott, M. (1989). The voice of liberal learning. New Haven: YaleUniversity Press. Partington, G. (1990). Quality and schools. Education Research and Perspectives, 17(2), 83-97. Ravitch, D. (1983). The troubled crusade: American education 1945-1980. New York, NY: Basic Books. Ravitch, D (2000). Left back: A century of battles over school reform. New York, NY: Touchstone Books. 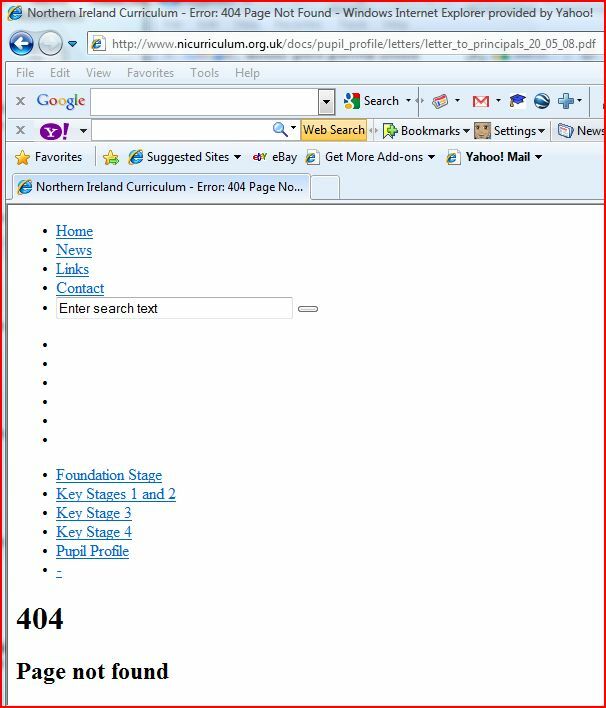 Gavin Boyd and CCEA fails Education (NI) Order 1998 on examination standards; again. Once again Northern Ireland’s exam body has failed to deliver on the Education (NI) Order 1998 awarding body standards and will slickly seek to reassure the public by conducting an investigation on itself. CCEA’s remit is to “conduct and moderate examinations and assessments, ensuring that standards are recognised as equivalent to standards of examinations and assessments conducted by other bodies or authorities exercising similar functions in the United Kingdom”. One again CCEA failed to deliver. CCEA only became aware of the wrong results issue after contact from 2 centres through the Enquiry About Results process. When CCEA staff investigated these enquiries they discovered that incorrect grades were awarded to 151 students. So much for standards. Parents and pupils may ask themselves how ” a unique educational body” can claim that the qualifications and examinations offered by CCEA, the unnecessary and expensive awarding body in Northern Ireland are of an appropriate quality and standard when on the one hand they fail to spot their own errors and then immediately reassure the same parents and pupils that their revised efforts are perfect. Self assessment means that the assessor is always in control. CCEA is an expensive luxury costing the taxpayer close to £30 million per year. It will be recalled that CCEA was mired in another recent controversy over the inaccurate results given to schools over their use of the Incas Pupil Profile. Incas was Gavin Boyd’s pet project when he was last chief executive of CCEA before leaving to become ESA chief execuive (designate). The Education Minister also had to issue an apology for that expensive failure of Gavin Boyd’s effort to replace objective measurement of attainment in numeracy and literacy with a “diagnostic” tool. CCEA’s interim chief executive Gavin Boyd said: “Staff at CCEA are very disappointed by this failure and we apologise unreservedly for any distress this has caused to students, their families and teachers. He neglected to mention that it is teachers who mark the exam papers. As opposed to the informal manner in which 151 pupils were given wrong results. Mr Boyd is clearly the man to lead the Education and Skills Authority. Do the Northern Ireland Education Minister’s supporters even listen to her? It seems that either the Education Minister is a poor communicator or that principals are ignoring not only her advice but her legislation. 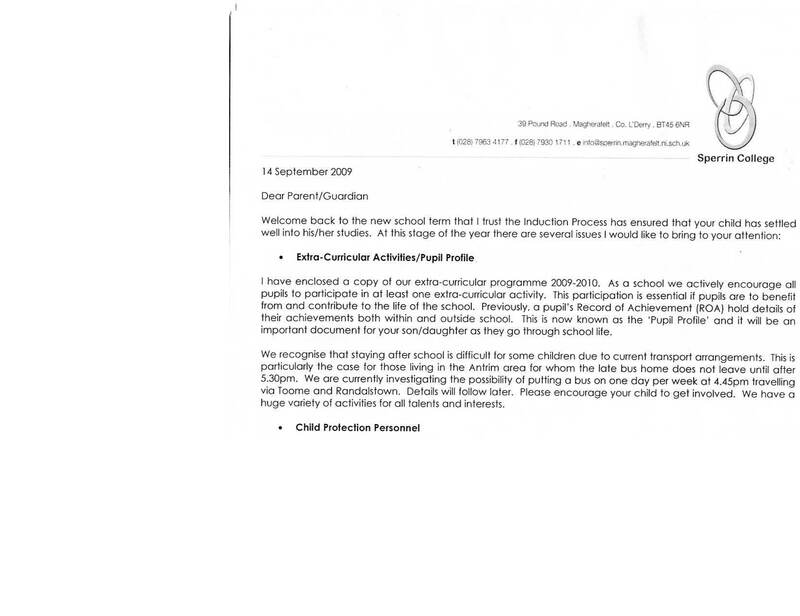 The following was sent to parents of pupils of Sperrin Integrated College in Magherafelt in September 2009. It is little wonder confusion and chaos denominates the quest for accurate information for parents in the post-primary transfer arena when the principal, Mr Rowan, continues to make reference to the Pupil Profile instead of the Annual Report to Parents. Perhaps the Minister will have a word. Parents needed “some clarity” about how their children were doing before they started at secondary school, Christine Gilbert told a committee of MPs. She also stressed the need for school report cards, being introduced by the government, to be clear and simple. Giving evidence to the cross-party schools committee on Wednesday, Ms Gilbert said KS2 results marked the end of an important phase of education. 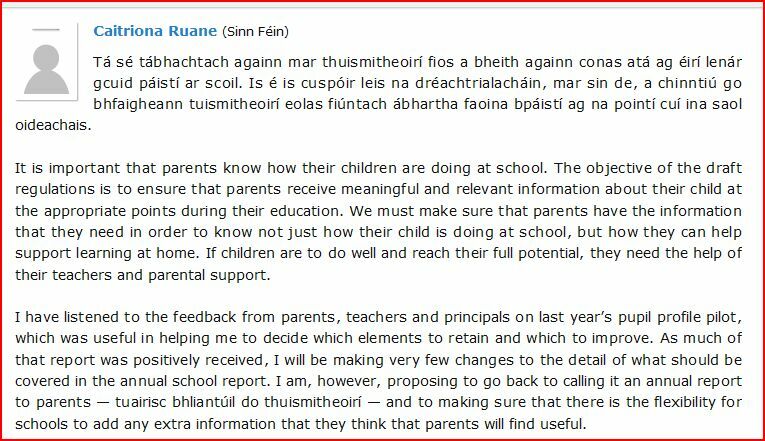 Perhaps Ms Gilbert should educate Caitriona Ruane on listening to parents, particularly on their feedback on the flawed Pupil Profiles. Meanwhile in her chaos ridden Department of Education in Northern Ireland testing of any type is denigrated by the ideological Minister of Education. While the chaos and confusion continues on the thorny matter of testing for entry to grammar schools, parents may want to remind themselves of Sir Kenneth Bloomfield’s favoured option for selecting buys for the Royal Belfast Academical Institution. initiative has cost her Department? in the question that the Department has wasted money. reporting to parents has not changed significantly. suggesting that teachers should not report to parents? they will now be called “annual reports to parents”. PACE had sought information from CCEA, the organisation responsible for the Pupil Profile, on costs in a Freedom of Information request. The information does not match the Education Minister’s statement to the Assembly. Only one party can be correct. The Minister of Education or one of the constituent organisations of the new Education and Skills Authority (ESA). Even with generous rounding of Caitriona Ruane’s figure up to £200,000 that leaves £1,800,000 unaccounted for. Now add up the figures and get £180,000. That’s the revised curriculum in action. The Governing Bodies Association of Northern Ireland’s voluntary grammar schools are an organisation in disarray.meltdown. The following extracts have been taken from notes of a meeting of the GBA Executive held on 18th January 2008. Events subsequent to that meeting which raise questions about the resolve of the Governors of Grammar Schools to preserve academic selection at 11 as a criteria for admission. The Pupil Profile, much loved by the GBA and Wilfred Mulryne, has met the outcome predicted by PACE years ago. Yet Mulryne continues to exact influence on the future of grammar schools in much the same way he did on the revised curriculum, the early years enriched curriculum and the Pupil Profile. 2009 may be the year to kiss the Mulryne influence goodbye. RHL: He suggested it was pointless to try to cobble up some form of words or find some phrase that would enable the pretence to be maintained that there was consensus or unanimity when patently that was not the case. He also suggested that it could be significant that in recent weeks and months the words “pupil profile” appeared to have been deleted from the vocabulary of the Minister and her senior officials. Was it not fatuous to think that the Dept could be persuaded to modify the pupil profile to such an extent that it would become a reliable indicator of a pupil’s abilities? In any event why should the GBA continue to believe that the pupil profile could be used as an instrument to match pupils to schools when the Dept itself declared that it was unsuitable for this purpose? Sir Kenneth Bloomfield He acknowledged that it was extremely difficult to reach a consensus but there was a real danger of accepting what was simply the lowest common denominator. The GBA’s previous policy document with its requirement for a genuinely robust pupil profile and provision for a receiving school not to accept any pupil clearly unsuited to the curriculum on offer were the very minimum acceptable criteria. Dr Mulryne replied that this was not exactly the case. It should be remembered that initially it was proposed that the receiving school would not be entitled to see the pupil profile but this position had been changed as a result of representations by the GBA. Moreover the pupil profile as now envisaged would contain objective assessments of a pupil’s abilities, eg reading age. Fr Patrick Delargy agreed. They should leave the Dept with what had already been submitted last year. No response had been forthcoming to that document. To forward another now might be seen as a watering down of the GBA’s position. At this stage the new paper should be considered as a basis for healthy internal debate. 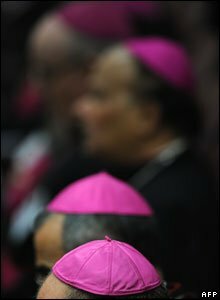 The suggestions of Sir Anthony and Fr Delargy were agreed. Executive officers are to meet Dept officials on Tue Jan 22 at 8-30am. There can be no doubt for parents that the subsequent proposals from Mulryne, Young and Donaghy were hatched well in advanced by the core architects of the GBA retreat away from academic selection. A footnote on “lobbying activity” reveals some possible explanation of the DUP mirroring the GBA position. Parents should closely examine Caitriona’s Pupil Profile/Incas Assessment reports. Since principals and teachers have been fully aware of this for quite some time it is remarkable that they provided no warning to parents. Why the silence? Why did the media reports from the BBC education correspondent cover only the principals’ comments. Indeed the Twinbrook principal admitted ignoring the comment bank provided. It probably means she could have staff work from home rather than in the classroom. In case Santa doesn’t bring you a better read. Exactly what is a developed ability and how is it measured? What is the Education Minister’s attitude?